Moving makes us consolidate. Makes us dream of functionality and design. It makes us envision color palettes and perfect accents. In short, it makes us reconsider our current lot. While traversing the neverending terrain at Ikea today, I noticed what seemed to be the perfect bedroom set. I was awed by its sleek design and in five minutes was very close to saying “Towanda” and replacing all of my old, shabby furniture with crisp corners and perfect organization. But, something felt wrong. I couldn’t stop thinking about the bedroom I’ve already built for myself. Completely confused I decided to leave sans yellow bag. Though I left without a purchase, I didn’t leave without a concept. Social media has companies and brands “reconsidering their lot.” Instead of thinking of how to incorporate the best aspects of their brands into a more integrated offline and online shop, some consider changing their core. They’re too busy oohing and awing at beautiful Facebook pages to think about their page strategically. Brands that have been around for a while, have spent real time, energy, and paint creating and maintaining their voice. They, like me, have some handcrafted furniture that’s been well-kept for years making it unique, not old. And now, all of a sudden, the move to social means it’s time to toss all of this hard work on the side of the road. Like there’s no real equation to work off of when designing a room, there isn’t exactly a set of commandments to help brands go social. What’s important is to remember what’s at the center of your brand’s voice(s). Remembering what your customers or your fans come to you for. Take your “old furniture” and translate it to social. This may mean reforming some parts of the brand that already exist. For instance, blending your age-old product knowledge, with a more modern way of communicating it. What are some of your favorite old meets new combinations? This entry was posted in Social Strategy and tagged brand voice integration, new to social media. ← Social Allie is Live! 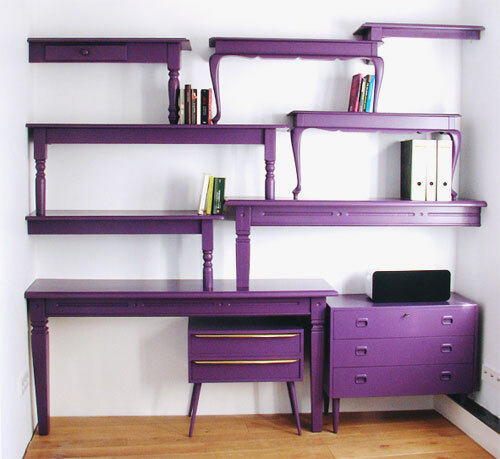 loved it!… but want to know… where’d you find this pix of the purple furniture?…. Thought it might be yours but realized it would be orange and have ALOT more stuff on the shelves!! !